This product is tough on dirt, yet easy on your clothes. It works hard on both whites and colourfast laundry loads to leave them clean and with a fresh, natural scent. Enzyme-free, they respect your family's skin using only plant based ingredients. New naturally inspired fragrances. Concentrated formula - suitable for 42 washes. Safe for sensitive skin. Tough stain action. Full of Smart Green Science. Plant based & mineral ingredients. Suitable based & mineral ingredients. UNEP award. Cruelty-Free International. 42 Washes per pack and 35 ml / g per wash. New improved fragrance! Lavender & Sandalwood. 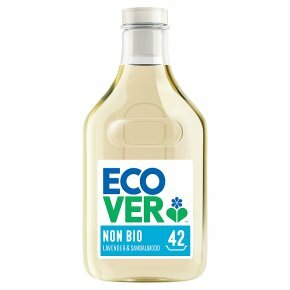 42 washes Ecover Laundry Liquids feature new, authentic fragrances inspired by nature that delight the senses. The concentrated formulas pack the same cleaning power as bigger packs, but with less packaging to carry home. Ecover harnesses the power of Smart Green Science to bring you a powerful clean by lifting dirt and stains away, even at lower temperatures. 89% of mums would recommend Ecover non-bio to a friend* *239 Mumsnet testers, May 2017. 85% would buy again and 89% would recommend. WARNING.<br>CAUSES SERIOUS EYE IRRITATION.<br><br>ECOVER NON-BIO CONCENTRATED LAUNDRY DETERGENT<br>Keep out of reach of children. IF IN EYES: Rinse cautiously with water for several minutes. Remove contact lenses, if present and easy to do. Continue rinsing. If eye irritation persists: Get medical advice/attention. If medical advice is needed, have product container or label at hand.